Heliae, with funding from the Mars family and Salim Group, goes after algal nutraceuticals and personal care products. According to algae entrepreneur Dan Simon, the CEO of Heliae, we're now in algae's second generation. I was here for Algae 1.0, and I must say -- it wasn't pretty. From 2004 to 2009, scores of companies, some with little experience in phycology or fuels, managed to extract hundreds of millions in cash from VCs in hopes of ultimately extracting fuel oil from algae. The hype fest was on. 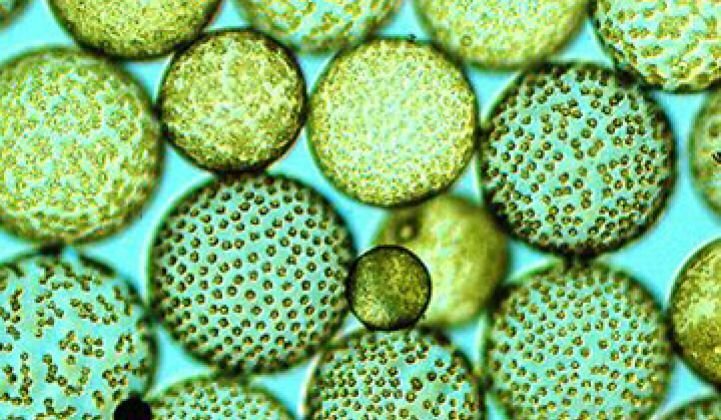 Entrepreneurs spoke of commercial algae fuels as being within near-term reach. Jim Lane of Biofuels Digest authored possibly the world's least accurate market forecast in 2009, projecting that algal biofuels capacity would reach 1 billion gallons by 2014. In 2009, Solazyme promised competitively priced fuel from algae by 2012. Nothing close to 1 billion (or even 1 million) gallons or competitive pricing has yet happened. On paper, algae is a strong feedstock for biofuels. It grows in a wide variety of climates and does not come down on the wrong side of the food vs. fuel debate. The liquid fuel potentially produced by these single-celled creatures is only one of their byproducts, and not even the most valuable. Cosmetic supplements, nutraceuticals, pet food additives, animal feed, and specialty tailored oils can fetch higher per-gallon prices. The tantalizing quality of algae is that some algal species contain up to 40 percent lipids by weight. So, according to some sources, an acre of algae could yield 5,000 to 10,000 gallons of oil a year, making algae far more productive than soy (50 gallons per acre), rapeseed (110 to 145 gallons), jatropha (175 gallons), palm (650 gallons), or cellulosic ethanol from poplars (2,700 gallons). The question is: Can algae be economically cultivated and commercially scaled to make a material contribution to mankind's liquid fuel needs? Five years after the great algae oil hype, the jury is still out on that question. In the meantime, most of the surviving algae companies have been forced to adopt new business plans which focus on the more expensive algae byproducts instead of the lure of economically priced algae fuel oil. Publicly traded Solazyme (SZYM) uses genetically modified organisms and fermentation to create algae-based products such as tailored oils, algal flour and proteins. The firm had Q2 revenue of $11.2 million and a net loss of $25.8 million. Firms such as Martek, Cellana, Sapphire Energy, Algenol, and BARD and many others are developing new products from algal sources. Most of the companies still aspire to fuel production in the longer term. We spoke with the CEO of 112-employee Heliae last week. Heliae has raised $80 million from two $20 billion food conglomerates, the Mars family and the Salim Group, and has spent the last five years developing a "platform technology" to produce nutraceuticals, personal care products and perhaps fuel. Those food giants invested in order to create "new, sustainable supply chains" for their food products, according to the CEO. Salim is the world's largest wheat noodle producer. Getting products out of algae is an involved process requiring efficient algae-strain identification, production at scale, and practical harvesting, de-watering and extraction. All of these steps have their risks and require energy. Heliae is growing four different strains commercially including species within the Nannochloropsis genus. The CEO said that the production technology is "a mixture of phototrophic and fermentation" and "gives a versatile co-product stream" with "pigments from the sun and concentration from fermentation." The company looks to complete and begin production at its first commercial plant in Arizona this year. Astaxanthin, a nutrient and coloring agent, is one algal product targeted by Heliae. "Nearly all commercial astaxanthin for aquaculture is produced synthetically, with an annual turnover of over $200 million and a selling price of roughly $5,000 to $6,000 per kilo as of July 2012," according to Algatech. Simon said consumers want a more sustainable supply chain for the product instead of one based on "killing fish." Simon also spoke of the ability to grow large proteins on algae and the potential to use algae cells to produce drugs, vaccines, and therapeutics. The CEO said, "We're in scale-up mode In Arizona. The goal was to build the smallest possible plant to prove out the platform and still be standalone cash-flow-positive." He added, "100 percent of the offtake is spoken for." Heliae will need to continue to locate capital to scale up, and the CEO is looking to raise $30 million to $70 million before the end of the year.